Lou was born on February 5, 1915 to Fred and Martha Wagner. She passed on Monday, November 27, 2017 at her home in Grayslake as she wished. Lou grew up on her parents’ farm on Peterson Rd. in what was then known as Fremont Center. After her marriage to Louie Blasius in 1938, she moved to Grayslake where she lived for the rest of her life. She was an active member of St. Gilbert Parish, belonged to numerous senior social clubs, and was always at the center of family gatherings. Lou was a beloved wife, a devoted mother, a doting grandmother, a favorite aunt, and a trusted friend. She will be missed. Lou is survived by son Richard Blasius and wife Maureen Blasius (nee Gessert); son Robert Blasius; grandchildren Tom Blasius, Brad Blasius, Kathie Blasius, Kristi Blasius, and Kristi LeFevre; great-grandsons Tad and Nathan Blasius ; and her sister Lillian Hertel of Grayslake. She was preceded in death by her husband of 53 years, Louis Blasius, daughter-in-law Susan Blasius (nee Behm), grand-children Mary and Timothy Blasius, brothers Fred Wagner, Robert Wagner, Frank “Chuck” Wagner, and Roy Wagner, and sisters Helen McGrath and Marie Knigge. A visitation is scheduled for Thursday, November 30 from 4-8 PM at Strang Funeral Chapel & Crematorium 410 E. Belvidere Rd. Grayslake IL. Mass of Christian Burial for Lucille C. Blasius will be held 10:00 AM Friday December 1 at St. Gilbert Catholic Church 301 East Belvidere Rd. Grayslake IL. Interment will follow at St. Mary’s Cemetery of Fremont Center 22333 W. Erhart Rd. Mundelein, IL. For more information please call (847)223-8122 or log onto www.strangfuneral.org. Jack Charles Kasper, 63, a resident of Grayslake passed away Thursday, November 23, 2017 at his home. He was born June 6, 1954 in Chicago, IL to Ronald and Elaine Kasper. Jack is survived by his wife of 35 years, Barbara, whom he married on June 5, 1982 at Prince of Peace. He is further survived by his children Lauren Kasper and Deborah (Shaun) Kincaid; his grandchildren Jaidyn, Shaun Jr., and Elijah Kincaid. He was preceded in death by his parents. Friends of the family may visit at STRANG FUNERAL CHAPEL & CREMATORIUM, 410 E. Belvidere Road, Grayslake, IL 60030 on Wednesday, November 29, 2017 from 4:00 p.m. until 8:00 p.m. The visitation will continue in the morning from 9:00am until 9:45am at the funeral chapel before the mass. The funeral mass is scheduled for Thursday, November 30, 2017 at 10:00 a.m. at St. Gilbert Catholic Church 301 E. Belvidere Rd. Grayslake, IL. Interment will be held privately. For further information, please call (847) 223-8122 or visit www.strangfuneral.org. Beverly Ann Cianciola, 74, a resident of Spring Grove and formerly of Hainesville, IL passed away Sunday, November 19, 2017 at her home. She was born August 20, 1943 in Chicago, IL to Joseph and Florence Latala. Beverly was a previous member of St. Gilbert Parish and was a retiree of Abbott Labs after 20 years of service. She enjoyed fishing and was an avid Cubs fan. Beverly is survived by her husband of 25 years, Raymond, her children Theresa Ann (Ron) Cianfichi, Linda Ann (Mike) Heckadon, Brian (Rebecca) Garrity, and Kevin Garrity, her grandchildren Rachel, Sarah, Emily, Patrick, Grace, Ashley, and Makayla, and her siblings Geri Artner, Judith (Dr. Thomas) Hebda, Joseph (Sue) Latala, Linda (John) Jasinski, Thomas (Donna) Latala, and Robert (Brenda) Latala. She was preceded in death by her parents. Friends of the family may visit at STRANG FUNERAL CHAPEL & CREMATORIUM, 410 E. Belvidere Road, Grayslake, IL 60030 on Sunday, November 26, 2017 from 3:00 p.m. until 7:00 p.m. The visitation will continue in the morning from 9:00am until 9:45am at the funeral chapel before the mass. The funeral mass is scheduled for Monday, November 27, 2017 at 10:00 a.m. at St. Gilbert Catholic Church 301 E. Belvidere Rd. Grayslake, IL. Interment will be held privately. In lieu of flowers, memorials may be made to Northshore University Health Systems Foundation for Pancreatic Cancer 1033 University Place Ste 450 Evanston, IL 60201. For further information, please call (847) 223-8122 or visit www.strangfuneral.org. Gearld James Dittmer, age 80, a resident of Round Lake, IL passed away Wednesday, November 15, 2017 at his home. He was born June 1, 1937 in Chicago, IL. He is survived by his wife of 59 years, Darlene, whom he married on June 6, 1958. Gearld is survived by his children, Kathleen, Geraldine (Steven) of Nebraska, Jeffery (Tracy), Edward (Carolyn), John (David) of Arizona, Mark (Jennifer), and Matt (Tammy); thirteen grandchildren, Christopher, Anthony, Jamie, Steven, Jr., Derek, Cassidy, Allison, Colt, Matthew, Jr., Tyler, Blake, Brianna, and Kyle; and four great-grandchildren, Dylan, Regan, Rory, and Gavin. He was preceded in death by his parents, Lola and John; two brothers, Kenneth and John; one sister, Shirley; and his son, Mark. Friends of the family may visit from 5pm until the time of the funeral service at 7pm on Tuesday, November 21, 2017 at Strang Funeral Chapel & Crematorium, 410 East Belvidere Road, Grayslake, IL 60030. For more information please contact (847)223-8122 or log onto www.strangfuneral.org. Lillian Louise Hayes, age 86, a resident of Ingleside, passed away Wednesday, November 15, 2017 at Hillcrest Nursing Home in Round Lake Beach. She was born November 24, 1930 in Bismark, MO to John Calvin and Jane “Jennifer” Abel. Lillian was a born again Christian. She is survived by her two children, Susan (Mark) McClellan of Oklahoma City, OK and Richard “Rick” Hayes of Ingleside and three grandchildren, Richard Hayes Jr. of Ingleside, Kaycee McClellan and Kyle McClellan, both of Oklahoma City, OK. She was preceded in death by her husband, Frank Hayes Sr., a son Frank Hayes Jr., and two siblings, John Abel of St. Louis and Olivette Gierse of St. Louis. Friends of the family may visit from 9am until the time of the service at 10am on Monday, November 20, 2017 at Strang Funeral Chapel & Crematorium, 410 E. Belvidere Road, Grayslake, IL 60030. Interment will follow at Wood Cemetery, 5000 W. National Avenue, Milwaukee, WI. For information please call 847-223-8122 or log on to www.strangfuneral.org. Bob Jarvis (91) was born in Cincinnati, Ohio in 1926. He always shared how he had lived in 7 states and in 18 houses before he was 18 but finally settled in Wildwood, IL at a place he called “Home” with his wife of 64 years. Our dad was the Anchor in our family and left us with a true legacy of Faith, Love and Devotion. We watched our father tirelessly take care of his wife as she battled Alzheimer’s, sitting by her bedside reading her journal aloud to her of their travels to all 50 states and 27 foreign countries. Our father faithfully and patiently sat beside her, holding her hand until she finally succumbed to Alzheimer’s in 2015. Bob loved to travel and enjoyed the outdoors as well as the cabin that they owned in the Northwoods of WI. Bob helped with the Boy Scouts and was active in Scouting for over 70 years. 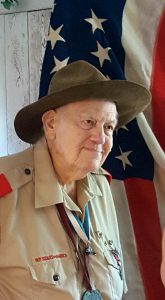 He served as a Scout Master and as an Assistant Scout Master to the Wildwood, IL Boy Scout Troop. Bob obtained the highest rank of Eagle Scout and was awarded a special Whitney Award and was also awarded a Silver Beaver. Bob Jarvis was honored with a 70-year pin in 2016 and received a personal letter from President George W. Bush. He was also able to go on an Honor Flight to Washington DC where he was able to meet Colin Powell and shake his hand. Bob was a member of Faith Baptist Church and was Re-baptized in the Jordan River by their Bible Study Leader and dear friend John Oberdier. Many knew Bob from leading the yearly Lake County Treasure Hunts from 1959 to 1982, as well as being a member in the Lake County Campers Club and one of the original home owners of Wildwood. Bob went to Duke University in North Carolina and graduated from Northwestern University in Evanston, IL in Engineering. Bob proudly served in the US Navy and US Marine Corps thru both WWII and Korean War. He also worked for Echo Products in Wheeling as an Electrical Engineer until he retired to spend more time traveling and relaxing up North at their Cabin. Bob had a kind, giving, and compassionate heart. He was known for giving flashlights to everyone he met, from the bank tellers, to nursing staff, physicians, technicians, neighbors and friends because he wanted to thank them for their kindness to him and just to see them smile. Bob was grateful to have had the opportunity to see and/or talk to each of his children and grandchildren prior to his passing. He personally told each of them how deeply he loved them and how he has faithfully prayed for them each and every night. It warmed his tender and failing heart to have talked to and seen so many who gathered to see him over his final days and wanted them to know that he would be okay no matter the outcome, as he knew his Salvation and he looked forward to seeing his wife again. We will forever miss this man for all he has taught us, for all he has instilled in us, for his kind and gentle compassion for others and for teaching us by example what Love and devotion really means. He is preceded in death by his wife Mary L Jarvis, whom he missed dearly every single day since her passing and two of his siblings, Dorothy Miller and Thomas Jarvis. He is also survived by his loving sister Barbara Payson from Vermont. His 4 children: Tom (Lois) Jarvis, Ken (Sue) Jarvis, Carol (Doug) McDowell and Mary Ann Jarvis; 9 Grandchildren: Andy (and Meredith), Ella (and Kevin), Robert, Amy, Christina (and Jeremy), Esther (and Jake), Diana (and Jason), Wesley, Lydia (and Kurt); and 11 Great Grandchildren: Season, Shane, Amaris, Rain, Ezmeralda, Liam, Nolan, Travis, Declan, Zackery, Jacob and a 12th Great Grandchild due in April 2018. Friends of the family may visit on Friday, November 17, 2017 from 4:00pm until 8:00pm at STRANG FUNERAL CHAPEL & CREMATORIUM, 410 E. Belvidere Rd., Grayslake, IL 60030. Further visitation is scheduled at the funeral home on Saturday November 18, from 9am until the time of service at 10am. Interment will follow at Warren Cemetery 1495 N Cemetery Rd, Gurnee, IL 60031. Ellis “Randy” Ezell, 58, a resident of Lake Villa, IL, passed away Sunday, November 12, 2017. He was a veteran who proudly served in the US Navy for 9 years and retired as an Air Traffic Controller from O’Hare Airport. Randy is survived by his wife, Suzy; his children (“The Magnificent 7”), Nicole, Eric, Sarah, Kyle, Danielle, Eric, and Nico; his grandchildren, Cylus and Brooke; and his brothers, David and Mark. He was a special uncle, cousin, and friend to many. A visitation is scheduled for Sunday, November 19, 2017 from 2:00pm until 5:00pm at Strang Funeral Chapel 410 E. Belvidere Rd., Grayslake, IL 60030. Interment will be held privately. For more information on services, call (847) 223-8122 or log onto www.strangfuneral.org. Robert E. Scofield Jr., 82, a resident of Mundelein, passed away Monday, November 13, 2017 in Lincolnshire, IL. He was born June 30, 1935 in Gary, IN to Robert and Shirley Scofield. Robert enjoyed photography, astronomy, and stained glass. Robert is survived by his wife of 32 years, Lynn, his children Katherine (Richard) Anderson, Michael (Kerri) McGowan, and Kelly (Robert) English, his grandchildren Megan (William), Sarah, Joshua, Kelsey, Pamela, Timothy, and Madison, his great-grandson Noah, and his brother James (Patricia) Scofield. He was preceded in death by his parents. A memorial visitation is scheduled for Sunday, November 19, 2017 from 1:00pm until 3:00pm at Strang Funeral Chapel & Crematorium 410 E. Belvidere Rd. Grayslake, IL 60030. Interment will be held privately. Memorial donations may be made to the Barrington Area Council on Aging www.bacoa.org. For more information on services, call (847) 223-8122 or log onto www.strangfuneral.org. 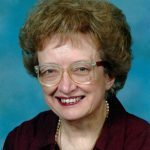 Judith “Judy” E. Barna, 77, a resident of Gurnee, passed away Sunday, November 12, 2017 at Good Shepherd Hospital in Barrington, IL. She was born November 13, 1939 in Hungary to Laszlo and Esther Kaszonyi. Judy worked as a secretary for Congressman Barrett O’Hara in Washington DC before opening her own ceramics shop, Judy’s Ceramic Station, in Round Lake. 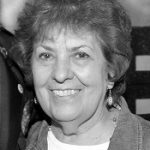 She was a devout Catholic and parishioner of St. Joseph Catholic Church in Round Lake since 1979, where she was actively involved as a Eucharistic minister, Lector, and volunteer. 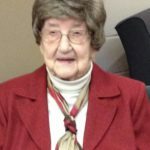 She collected stamps, enjoyed crocheting, and loved crafting including scrapbooking. Judy is survived by her daughters Helen (Rudy De Ram) Barna, Nancy (Jason) Rusnak, and Jennifer (fiancé Kevin Kleinhans) Barna, her sister Mary Kaszonyi, and her numerous nieces and nephews. She was preceded in death by her parents and her brother Peter. A visitation is scheduled for Saturday, November 18, 2017 from 8:45am until 9:30am at St. Joseph Catholic Church 114 N. Lincoln Ave. Round Lake, IL 60073. A memorial Mass will be held at Church at 9:30 am. Inurnment will follow at Ascension Catholic Cemetery in Libertyville, IL. For more information on services, call (847) 223-8122 or log onto www.strangfuneral.org. James “Jim” Erickson, 51, passed away Sunday, November 12, 2017 at his home after a courageous battle with colon cancer since February of 2017. He was born July 10, 1966 to Ronald and Judy Erickson. Jim was a great man, compassionate and always willing to lend a hand to help. He coached baseball, soccer, and was a former GNHS liaison to the GNBC Baseball Club Board. Jim was an avid car enthusiast and loved going to all things car related such as car shows, Volo Auto Museum, Mini-Cooper Road Rallies and annual Chicago Auto Show. He worked very hard, loved his job and his family. His devotion and love will continue to be felt throughout the Grayslake Community. Jim loved all things Disney World and loved his trips to his beloved Galena, IL. 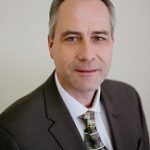 He was the President and a Principal of KGH Architects since May 1990 and had over 27 years of experience in various architectural repair and restoration projects. Jim is survived by his wife of 25 years, Christine (nee: Arendt) Erickson, whom he wed on September 12, 1992, his parents Ronald and Judy, his children Emily Marie and Edward James, his brother Jeffery (Jayne) Erickson, his brothers-in-law Thomas (Jane) Arendt and Patrick (Vivian) Arendt, his sister-in-law Elaine (Tom) Unti, his nieces and nephews Lauren (Scot) Gammill, Brianna Arendt, Julie and Eric Unti, and Oliver and Ainsley Erickson, his many aunts, uncles, and cousins from the Erickson and Rosch families, and his beloved pets Paige and Lilly. A visitation is scheduled for Thursday, November 16, 2017 from 3:00pm until 8:00pm at Strang Funeral Chapel & Crematorium 410 E. Belvidere Rd. Grayslake, IL. The visitation will continue in the morning from 9:00am until the 9:45am at the funeral chapel. A funeral mass is scheduled for Friday, November 17, 2017 at 10:00am at St. Gilbert Catholic Church 301 E. Belvidere Rd. Grayslake, IL. Interment will follow at Ascension Cemetery in Libertyville, IL. In lieu of flowers, memorials may be made to the Northern Illinois Food Bank www.solvehungertoday.org or Make a Wish Foundation www.wish.org. For more information on services, call (847) 223-8122 or log onto www.strangfuneral.org.